Santa Lucia sticky monkey-flower (Mimulus aurantiacus var. grandiflorus) blooming at The Indians last weekend. It’s been a hot, dry spring so far, and most of the wildflowers are already disappearing. That just makes the Santa Lucia sticky monkey-flower, which doesn’t mind the heat, stand out even more than usual; and makes it a natural choice for our Wildflower of the Week. It’s been so hot and dry, in fact, that fires began breaking out around the state on May 2; even in the heavy timber of the Northern Sierra. That’s easily the earliest start to the fire season that anyone here can remember. 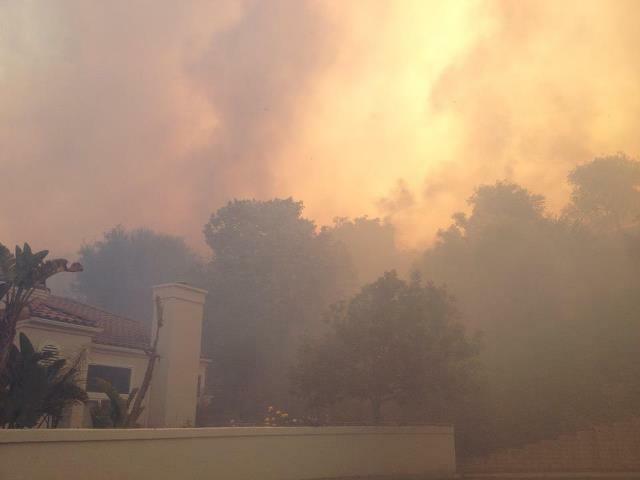 Photo our friend, Kevin, took as the Spring Fire passed through Camarillo on May 2, shortly before fighting it in his backyard with a garden hose. No word on whether he employed the traditional Southern California homeowner firefighting uniform of flip-flops and shorts. 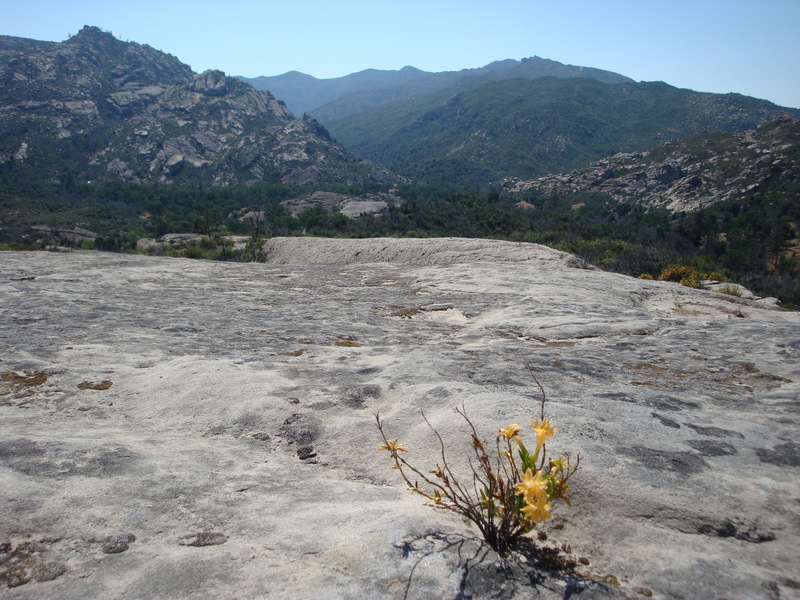 There are lots of varieties of sticky monkey-flower and the big, showy version that grows in our own Santa Lucia Mountains was, until recently, considered to be a variety of its own (bifidus). The botanical powers that be have now determined, however, that it is really the same variety found in the Lake Tahoe area (grandiflorus); so bifidus is no more. But whatever you call it, it’s certainly bigger and more ornate than the sticky monkey-flowers that grow on the Monterey Peninsula and along the coast (M. aurantiacus var. aurantiacus). Santa Lucia sticky monkey-flower blooming together with blue dicks (Dichelostemma capitatum) near Cisco Creek in the Ventana Wilderness. The Mimulus genus once belonged to the Scrophulariaceae, or Figwort Family, but has now been moved to the greatly expanded Phrymaceae, or Lopseed, Family. There is also a botanical faction that favors removing dry soil species, like sticky monkey-flower, from the, generally mud-loving, Mimulus genus, and placing them in a genus called Diplacus – and they may be found residing under that alias in a number of publications. 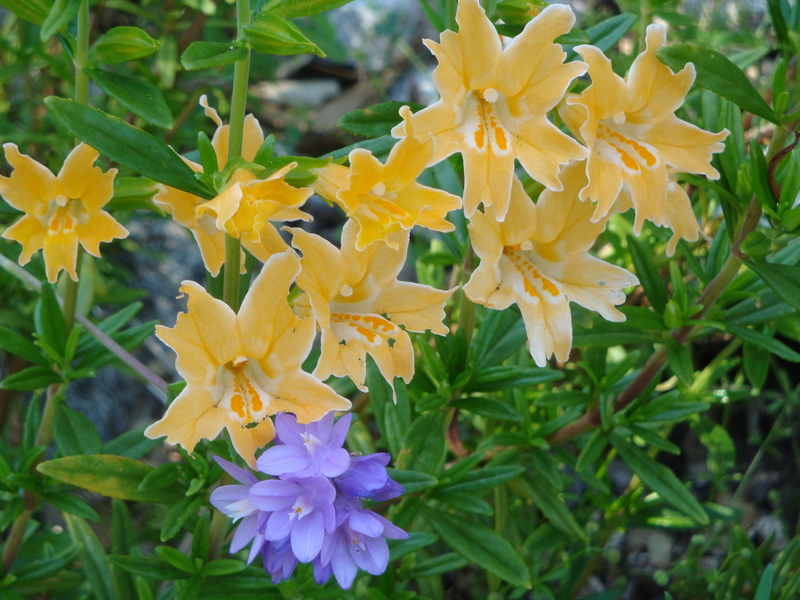 The delicious nectar that accumulates at the base of the flowers makes all varieties of sticky monkey-flower popular with bees, hummingbirds and children; who inaccurately, though understandably, tend to call them honeysuckles. Native Californians are reported to have used the flowers and roots for medicinal purposes, but we’re pretty sure they enjoyed the nectar too. This entry was posted on Wednesday, May 8th, 2013 at 6:32 pm and is filed under Plants, Santa Lucias, Wildflowers. You can follow any responses to this entry through the RSS 2.0 feed. You can leave a response, or trackback from your own site.